If you’re attending any festivals this year this has got to the coolest canvas to camp out in, say hello to the VW Camper Van Tent. Officially licensed by Volkswagon the VW Camper Tent is a full size replica of the 1965 Camper Van. Available in yellow, red or blue, it is certain to stand out from all other tents. Like the VW camper van the VW tent is large enough to stand up in (5 feet and 11 inches), and internally is divided into two rooms, sleeping 2 people in each one. 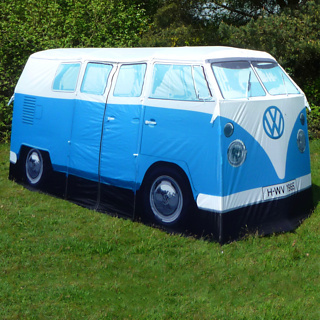 The VW Camper tent is available on pre-order from Firebox for £299.99 (approx $486) and will be available from August 25th 2011, just in time to catch the end of the festival season. Man I wish we had these when I was a kid That would be a great thing to play in when camping. Me and my friends could act like were on an adventure or some thing. SOOOOO cool. Have to have this for the cottage!! !